Summary: Choosing a type of contact lens solution can be difficult due to the various brands and types of solutions available. This guide will help break down what you need to get started. There is no single brand of contact lens solution that is the very best. All brands that are sold at your local drug store have been demonstrated to be effective when used properly and have been approved by the FDA. 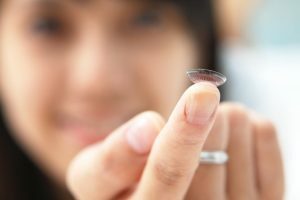 However, there are different types of solutions available that work best with certain types of lenses like Bausch and Lomb contacts for example. For any type of contact lens solution to be effective, you must follow strict instructions for use that appear on the product label and other instructions that you eye doctor provides you with. Multipurpose contact lens solutions are dual-purpose liquids that can both clean and disinfect the lenses. Many contact lens users prefer using this type of solution because it is less expensive and easier to use than the hydrogen peroxide-based alternative. Therefore, contact lens users are more likely to use these appropriately. Similar to multipurpose solutions, this contact lens care system disinfect contact lenses. However, these solutions tend to be a bit more tedious to use. Practitioners who recommend this solution advise that you first clean your contacts with a separate cleaning solution and rinsing them thoroughly with a sterile saline solution before the disinfecting phase. Although it may be cumbersome to use, it can thoroughly disinfect any contact lenses that you purchase from Lens.com or other supplier. Whether you go with a multipurpose solution or a hydrogen peroxide-based solution, you will ultimately need to take proper care when handling your contact lenses. Regardless of the solution, without handling them the way your eye doctor recommends, you run the risk of irritation or an infection. When in doubt, consult with your practitioner.